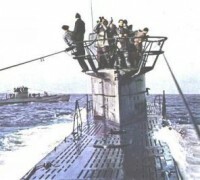 Sunk 11 March 1944 some 556 miles south of Capetown, in pos. 41º 28"S 17º 40"E.
55 Dead. All crew lost, being 43 Germans and 12 Italians. Alpino Bagnolini (pennant number BI) was launched 28 October 1939 and completed on 22 December 1939. Bagnolini was at sea when Italy declared war, and torpedoed the cruiser HMS Calypso south of Crete on 12 June 1940. A second Mediterranean war patrol was unsuccessful. Bagnolini sailed on 9 September 1940 and passed the Strait of Gibraltar on 13 September for an Atlantic patrol to Bordeaux on 30 September. En route Bagnolini torpedoed the neutral Spanish freighter Gabo Tortosa. Bagnolini sank a single ship on its first BETASOM patrol before being damaged by anti-submarine patrols. A July 1941 patrol off Gibraltar and a patrol off the Azores from 18 January to 22 February 1942 were unsuccessful; and three patrols to the South Atlantic from 24 April to 28 June, from 15 September to 7 November 1942, and from 14 February to 13 April 1943 were similarly unproductive. 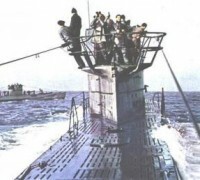 After conversion to a German transport submarine, Bagnolini sailed as UIT-22 on 26 January 1944 and was sunk off the Cape of Good Hope by No. 262 Squadron RAF Consolidated PBY Catalinas on 11 March.